One round of each stroke, take the average of each round of 3×100 and add together for an estimated 400 IM time. You can still sign up for our weekly e-newsletter to get an info-packed email about all things coaching and swimming delivered straight to your inbox every Tuesday morning. This set is a spin-off from the 15-minute Kick for Distance Test Set from yesterday. Divide the swimmers into two teams — the team that successfully achieves their 5:00 goal the most times wins (think of a good reward for winning). This is one of my favorite kick sets. For each of the blue times, the swimmer is trying to kick as far as possible. I use a wrench banging on the side of the pool to tell each successive group when their time is up. When they have completed the time, they pick their head up and check their distance (I have set kickboards on the side of the pool every 5m/yards) to the nearest meter. Returning to the wall, they immediately start the 200 ez. The goal for 2:10= 2x the achieved 1:00 Distance. Goal for 4:20 = beat the 4:30 distance. Goal for 2:00 = beat the 2:10 distance. Goal for :50 = beat the 1:00 distance. Total time kicked is 15:00, so we write down the distances and add them up for total distance kicked in 15:00. 20. Can You Spot Me? 10. How Low Can You Go? This is a kick set that we have done a few times this season. We keep track of our “best distances and use it as a benchmark. P100 = 100 yd race pace. We performed the first one of each set from a dive and the rest from a push. We performed the following kick set last night in order to test our kicking ability and fitness coming off a recent taper meet. It is essentially three broken 1,000s with some easy swim and drill mixed in between. In the first 1,000, swimmers could use a board if they liked or could kick in any of our standard body positions. 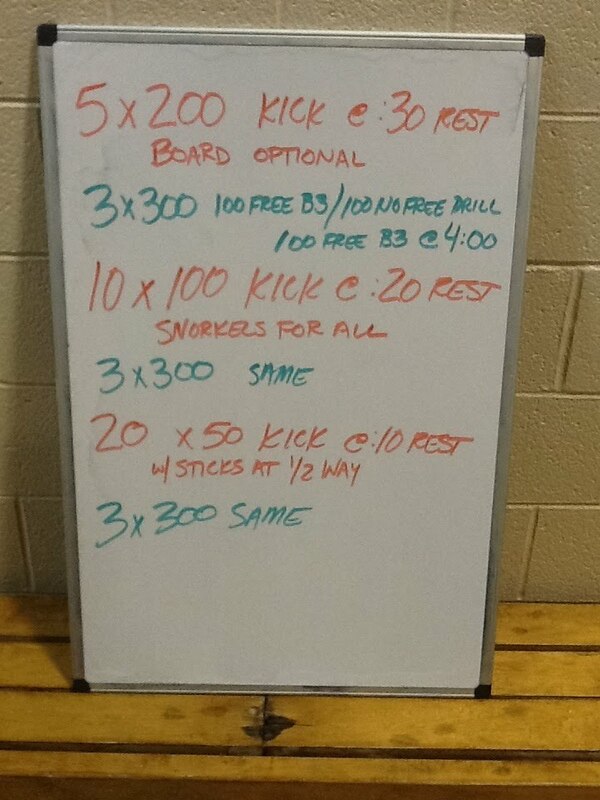 Typically when given this option, many of our swimmers prefer to kick on their backs. For the second 1,000, no boards were allowed and swimmers had to wear a snorkel, meaning that they had to kick either face down or on their side (which we do for free and fly kick). The third 1,000 used Streamline Sticks at the 12.5 yard mark and emphasized underwater dolphin kicking (in any body position) and the swimmers could choose the body position to continue kicking in once they surfaced. We recorded total times for each 1,000 and will use this information to develop kicking intervals for the next few months of training. Last week I posted the Distance Swimmer’s Delight workout on this blog. It was one of our most viewed workouts ever. This past weekend, several of the swimmers who completed that set competed in a meet. I thought it would be interesting to compare the results from the practice with results from the meet. I like having our athletes kick for maximum distance in a specified amount of time. Like most teams, our range of kicking speeds is greater than our range of swimming speeds, so kicking for distance becomes an effective way to challenge each athlete when we don’t have the ability to go on 6 different intervals. When we kick for distance, I like to put markers on the edge of the pool every 5 yards so that the athletes can determine their disance kicked to the nearest yard. Over at Swim Coach Direct, Ken DeMont and Don Swartz have a fantastic set from Jack Bauerle that he presented at the ASCA World Clinic. It is 40 x 50 @ :40 with some very specific instructions. See it here. The set below uses timed kicks for maximum distance. Mixing in some kick-heavy drill, this set lasts approximately one hour. In total, this is 35 minutes of kicking at high intensity. We gave our swimmers specific distances to shoot for during each timed kick, dividing them up into two teams. The numbers at the very bottom represent the running points total from the team competition. 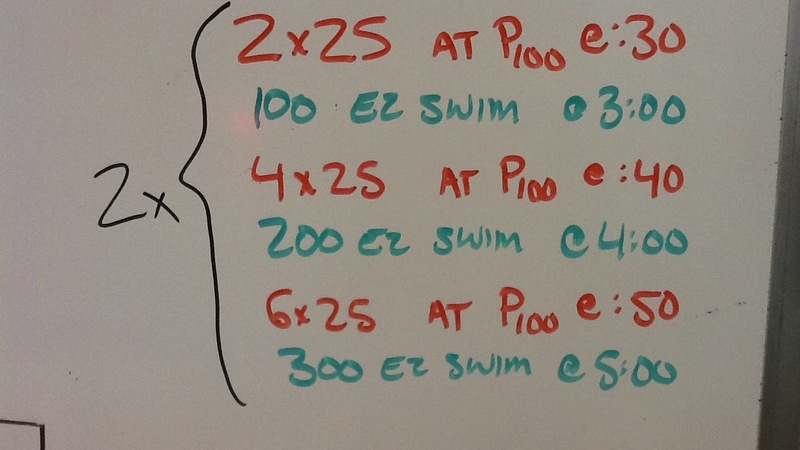 This set uses performances from our 15-minute Kick Test Set to set goal distances for each swimmer. Total distance from that set divided by 10 gives the goal for each 1:30 segment below. SCY This set is intended to test an athlete’s turning ability as well as encourage him or her to improve this all-important skill. It works for open turns with fly or breaststroke swimming. If you have touch pads that can measure turn time, this set could also be good for back or free. Swimmer performs 1 x 200 for time. Coach times the swimmer’s turns (from hand touch to feet leaving the wall) cumulatively using the start and stop buttons on the watch. Record swimmer’s total turn time and average turn time. For instance, a good total might be 7.00 seconds, average turn time of 1.00 seconds per turn. Swimmer then performs fast 50s on a moderate interval (perhaps a 1:1 work:rest ratio). If the swimmer’s total turn time was 7 seconds, then he does seven 50s. If it took him 10 seconds, he does ten 50s. During the 50s, the coach times the swimmer’s turn. Swimmer must beat his average turn time by .2 seconds and give a good effort on the 50 for it to count. If doing this set in a group setting, divide the swimmers into teams, each swimmer with a partner on the opposite team and a stopwatch per partnership. Team with the least # of 50s to do wins. Repeat Set 3 Times. All 25s are to a hand touch. Do Not Flip. This set challenges the athlete to swim at speeds approaching race pace over an increasing distance. Use cones or markers on the side of the pool so that both coach and athlete know the finish line. Time stops when the athlete’s head passes the cone. The goal on each swim is to beat your lifetime best 200m time. Swim #5 – 195m and finish to the wall to get your 200 time. On the JUST GO FAST parts, use the Tempo Trainer as a guide, but do not worry if you cannot hold it. Record your total distance and repeat at a later date and time to find out if you have improved! 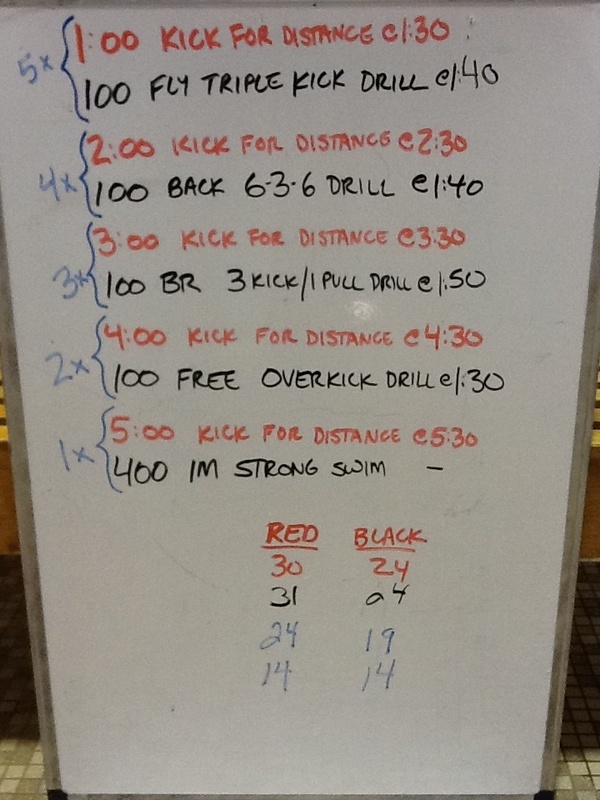 Get your total time for the 25s and subtract 3:00 to determine your total broken 500 kick time. 12.5 Fast UW kick/ 12.5 ez kick – Timed to the tenth of a second to the athlete’s head crossing the line. Do 3 rounds dolphin kick face down, 3 rounds dolphin kick on back, 3 rounds dolphin kick on side or breaststroke pullouts, and the last round is choice. We do the UW kicking in lane 1 with an athlete leaving every 10 seconds. This allows the coach to rapidly time every athlete to 12.5 yards. Upon completing the 25, the swimmer moves to lane 2 or 3 for the 75. This helps the keep the lane clear for the underwater kickers. For purposes of the The Swimming Calculator, I have defined the levels of kicking ability for senior swimmers as the following times to 12.5 yards. You will need all swimmers PB in 200 IM minus the fly split. 3 x 150 IM desc 1-3 . Interval should allow 20-30 sec rest. Their goal is to beat that split on #3 each time. Writing their #3 results on board as we go is big motivator. Did this one the other day. It really seemed to set the kids up for success (swimming at P200). Works for any stroke. You may remember the 15-minute Kick Test Set. +’s of doing it this way: Less time to complete the set, easier to calculate the swimmer’s total distance kicked. -‘s of doing it this way: You no longer have the motivational “double-up” the distance and “double-down” during the set, as swimmers no longer are counting their yardage precisely in each set. The following set is from Coach Shipherd’s presentation at the 2009 ASCA World Clinic. He described it as one of the favorite challenging test sets that his team does. Here’s a good set for working kick speed and endurance and some all out sprinting speed. Even: Maximum speed with a great finish!